My family moved to the Berryessa district of San Jose in 1964. From the front window of my family home, I could see across the acres of orchards and farmland into downtown San Jose. Many years have passed. 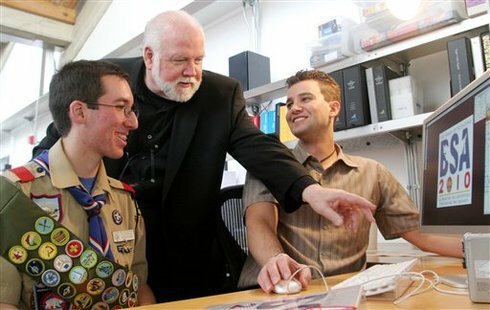 San Jose, once the center of the "Valley of Heart's Delight" is now the capital of Silicon Valley. This past weekend, History San Jose sponsored a Fandango at the Peralta Adobe to celebrate the founding of San Jose in 1777. Happy Birthday, San Jose! Happy Birthday, Governor Arnold Schwarzenegger!!! Long Life and Good Health! 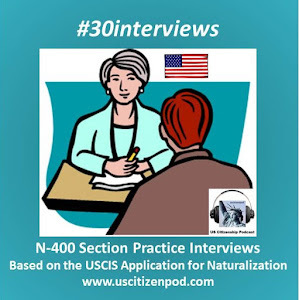 Andrew's Journey to a New Life in America discusses problems with Eligibility/Personal Info (N-400 Parts 2 & 3), Jobs (N-400 6:B), and Crime (N-400 Part 10:D). My students love to read and discuss these stories! The students are very concerned about identity theft and were surprised by the story's ending. Read the modified Chapter 1 pdf and the other chapters, order the book from Amazon.com, or borrow it from your local library. The MICHIGAN Stories for Newcomers are original fiction written for adult English learners who wish to improve their reading and English skills. 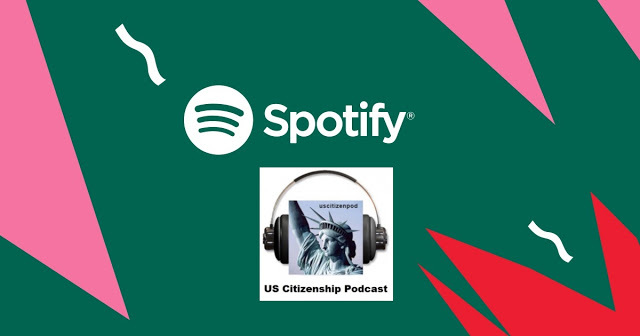 These stories allow adults to read about the experiences of new speakers of English and learn about life in the United States. A modified, simpler and shorter, version of the story is provided on the website. 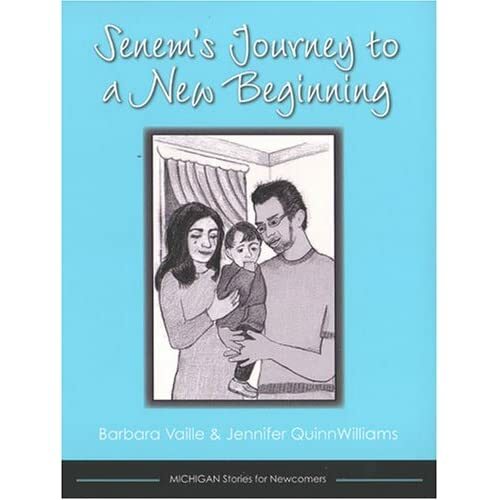 In Senem's Journey to a New Beginning, Senem is a Turkish woman living in the United States and taking care of her family—her husband, Tarkan, and their son, Hasan—while adapting to a new language and new customs. Her task becomes even more challenging when Hasan is kidnapped and when she gets word of a natural disaster back home. With the help of her family and her new friends, however, Senem manages to find the strength to thrive in her unfamiliar setting and make new beginnings in her life. Senem's Journey to a New Beginning discusses problems with Children (N-400 Part 9), Crime (N-400 Part 10:D) and Emergencies (N-400 Part 10:39). My students love to read and discuss these stories! The Chinese students identified with Senem waiting for news about her family after there was an earthquake in her home country. Read the modified Chapter 1 pdf and the other chapters, order the book from Amazon.com , or borrow it from your local library. 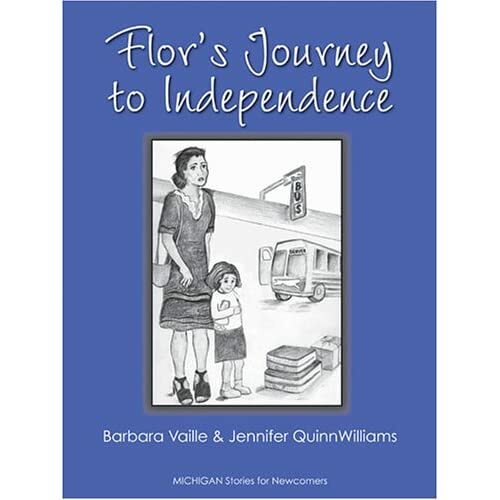 Flor's Journey to Independence begins as Flor and her four-year-old daughter, Betina, are unexpectedly abandoned by Flor's husband, Ricardo. Flor is suddenly faced with paying the bills and caring for Betina on her own, as she struggles without speaking much English. Still, Flor's determination gets her through the hard times, and once she enrolls in an English class for adults and begins working, she finds that her new life brings her new friends and opportunities. Flor's Journey to Independence discusses problems with Marital Status (N-400 Part 8 & Part 10:22d) and Child Support (N-400 Part 10:22g) and issues with finding Housing (N-400 Part 4 & Part 6:A) and keeping a Job (N-400 Part 6:B). My students love to read and discuss these stories! The students were especially sympathetic to Flor's problems finding good childcare. The MICHIGAN Stories for Newcomers are original fiction written for adult English learners who wish to improve their reading and English skills. 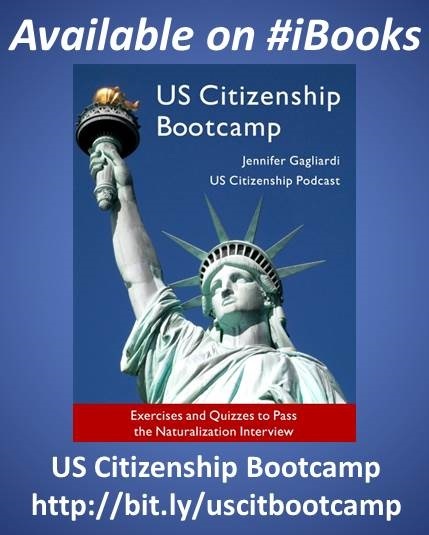 These stories allow adults to read about the experiences of new speakers of English and learn about life in the United States. A modified, simpler and shorter, version of the story is provided on the website. My students love to read and discuss these stories! 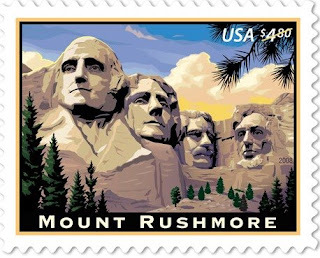 On June 6, 2008, the US Postal Service issued a new Mount Rushmore ($4.80 Priority Mail) stamp. Mount Rushmore National Memorial is very popular tourist site located in the Black Hills of South Dakota. Carved into this mountain of granite are the faces of four American presidents: George Washington, Thomas Jefferson, Abraham Lincoln, and Theodore Roosevelt. According to a 1929 budget document, the monument was intended “to commemorate the founding, expansion, preservation, and unification of the United States (source USPS.com). For more info, see VOANews American Mosaic: Mount Rushmore. A very special naturalization ceremony took place in Southport, NC where a group of 100 members of the United States armed forces will become U.S. citizens. Click here for the video from WWAY Channel 3 News (Wilmington, NC). Note: There are several military and naval bases near Southport , NC. 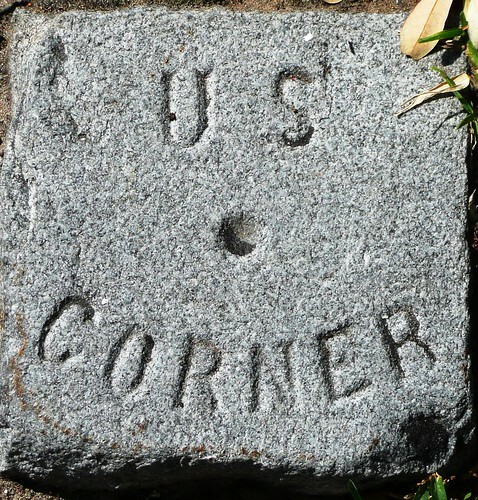 The above photo is the corner marker of the former Fort Johnston military reservations built in 1745. The fort was destroyed in 1775 by the US Patriots protesting the Stamp Act. One of my all-time favorite sites on the web is the NYTimes.com Learning Center which contains articles, activities, and lesson plans based on current topics. All the lesson plans are geared towards grades 6-12, but the material can be adapted for Adult ESL and Citizenship students. Lesson plans are linked to current news stories and you can search for past lesson plans by topic. 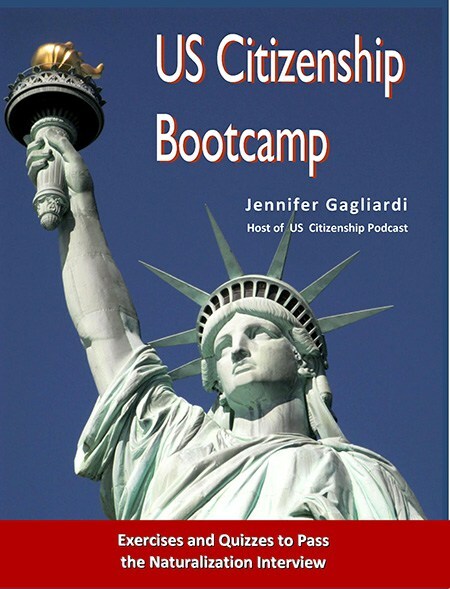 Today's lesson plan focuses on the topic of Immigration and is linked to an article about Day Laborers in New York. Also of interest is the online almanac This Day in History, which has inspired many warm-up and enrichment activities in my Citizenship class. Here are ten sentences for reading and dictation. These sentences are based on answers to the USCIS 96:51-60 Questions. Instead of phrasal responses, the answers are given in complete sentences. 51. The executive of a state government is the Governor. 52. The head executive of a city government is the Mayor. 53. Thanksgiving was celebrated for the first time by American colonists. 54. Thomas Jefferson was the main writer of the Declaration of Independence. 55. The Declaration of Independence was adopted July 4, 1776. 56. The basic beliefs of the Declaration of Independence are that all people are created equal and have the right to life, liberty, and the pursuit of happiness. 57. The national anthem of the United States is the Star-Spangled Banner. 58. Francis Scott Key wrote The Star-Spangled Banner. 59. The minimum voting age in the United States is 18 years old. 60. The President signs bills into law. In 2005, Canadian artist, Janet Morton, taught at the University of Wisconsin. While she was in Madison, Morton became fascinated with the Wisconsin Capitol Building. The building was modeled on the US Capitol, the place where Congress meets. 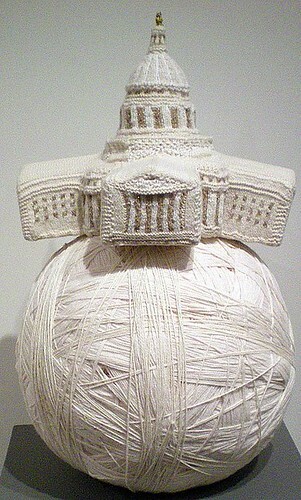 This knitted sculputre is part of the Beyond Knitting: Uncharted Stitches, currently on display at the San Jose Quilt Museum. The Seneca Falls Convention, July 19 to July 20, 1848, was the first women's rights convention held in the United States. The convention leaders, Elizabeth Cady Stanton and Lucretia Mott, were later joined by Susan B. Anthony, Carrie C. Catt, to work for the abolition of slavery (the 13th Amendment), temperance (prohibition of alchohol--the 18th Amendment), and women's suffrage, the Nineteenth Amendment. 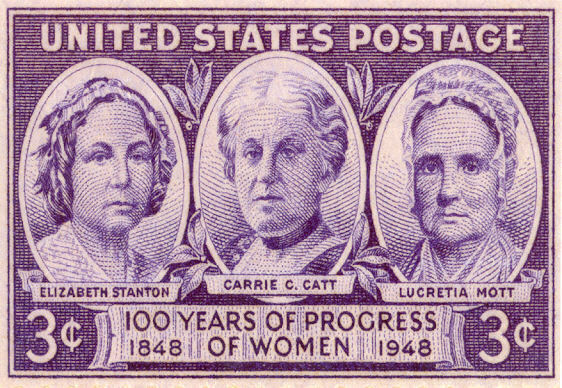 Because of the hard work of many brave women and men begun at Seneca Falls, Women have the right to vote! The League of Women Voters honors the Nineteenth Amendment by educating voters about political issues and sponsoring candidates' debates. Members of the local chapters of the League of Women Voters attend Oath Ceremonies where they register many new citizens to vote. John Potter and his family has created hundreds of Word Search puzzles. The puzzles aare organized into the following categories: General, Kid's, Geography, Holidays, Letters, Bible, Sports, and TV-Movies (*hint* the Letters Word Search Puzzle are helpful for pronunciation practice). 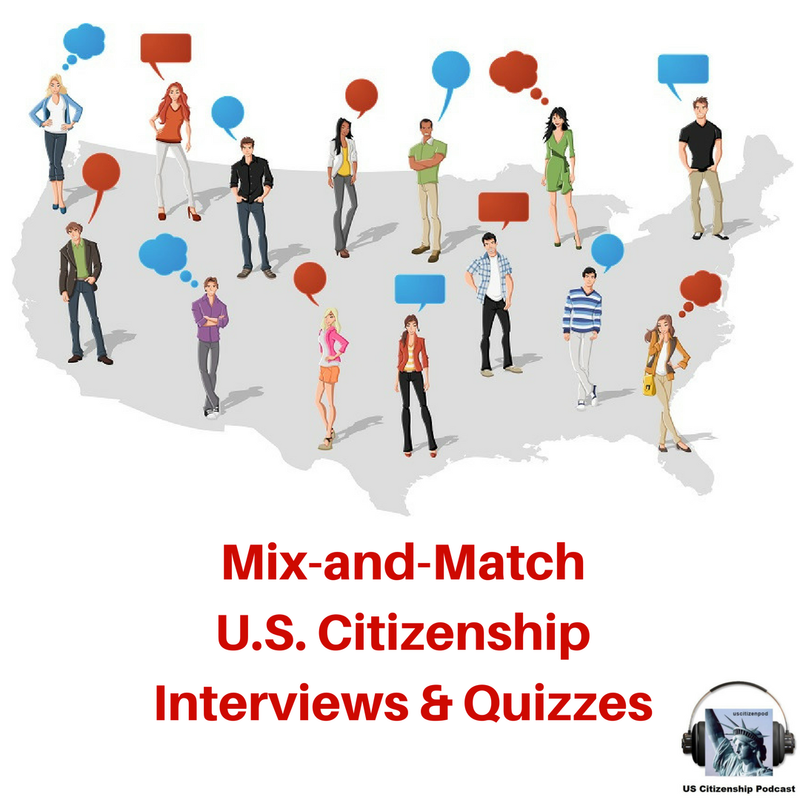 Here are some puzzles related to the USCIS 96/100. Awesome Stories has many high-interest US History stories that students in pre-GED or Intermediate-Advanced ESL classes would enjoy reading. Some stories include audio clips. 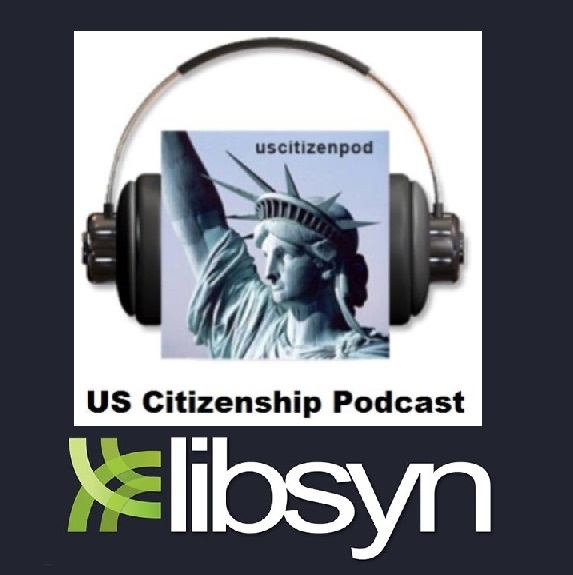 Here are three sample stories related to the USCIS 96/100. American Colonies: We are Free! The story of the Declaration of Independence and America’s decision to sever ties with Great Britain. US Constitution. The story of America’s Constitution (and the convention which created it). Star-Spangled Banner: The story of Francis Scott Key and the poem which became a national anthem. Here is an article and video of a recent Oath Cermeony at the Gerald R. Ford Presidential Library & Museum in Grand Rapids, Michigan. David "Big Papi" Ortiz, native of the Dominican Republic and All-Star fielder for the Boston Red Sox, recently took the Oath of Citizenship. This video includes the Oath of Allegiance, the Pledge of Allegiance, and a post-ceremony interview. Like many new citizens, he attended the ceremony with his family, then immediately went to work after the ceremony. Godspeed his recovery--see Big Papi next year at the All-Star Game!!! 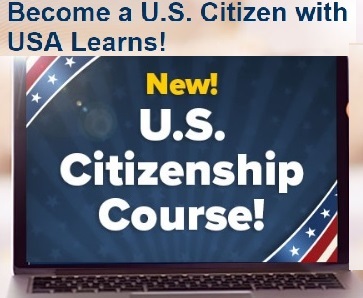 Summary: People who enroll in the USCIS Academy learn how to become USCIS officers. They study immigration law and history. They are part of a nationwide effort by the USCIS to recruit and train hundreds of new employees who will help tackle the agency's mountainous backlog of cases. USOC: The Official Website of the US Olympic Team--checkout the videos and photo galleries here. NYTimes: Born and Trained Elsewhere, Competing for the U.S.
TusconCitizen: Tucsonan Lagat legs out big win at Olympic trials...Tucsonan Bernard Lagat said he took every word seriously when he recited the oath that made him a U.S. citizen. Maybe that's why the smile was so wide when he finally became a U.S. Olympian. 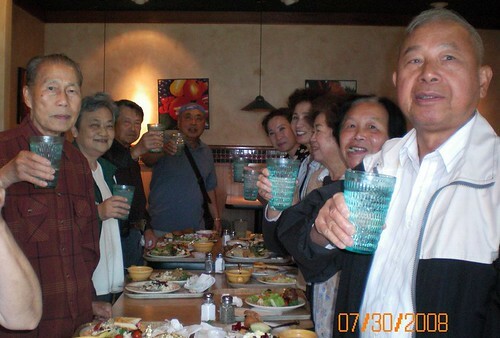 . .
Slide Show: Milpitas, a city proud of its cultural diversity. 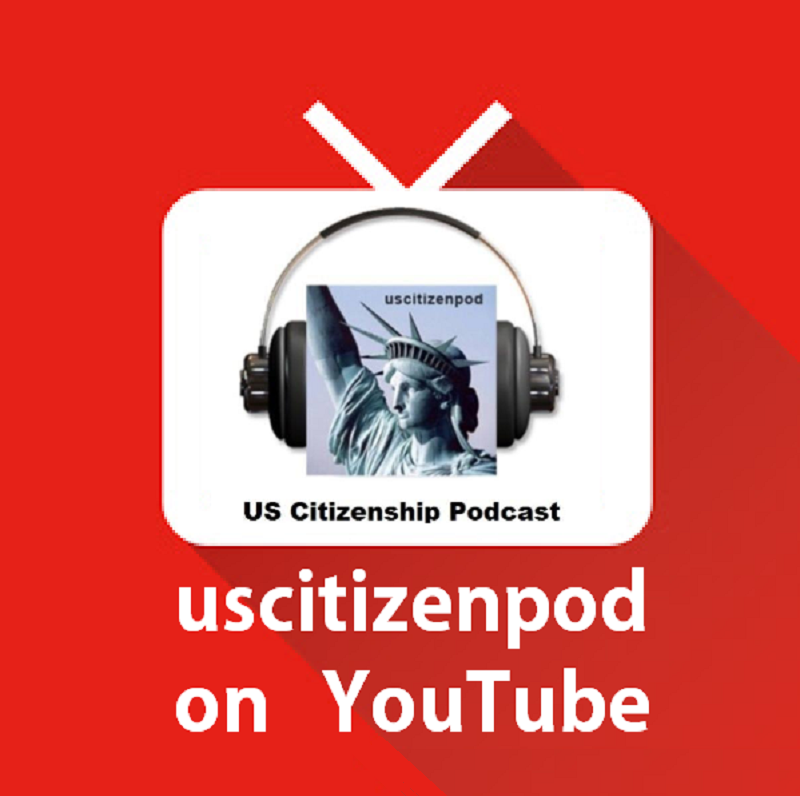 US Citizenship Podcast is produced at Milpitas Adult School. 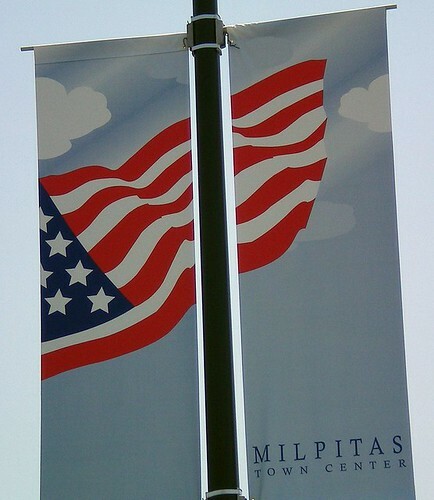 Click here to see four short slide shows highlighting the history and cultural diversity of Milpitas, CA 95035! Congratulations to Mr. and Mrs. Nakrani on passing their US Citizenship interviews! **Good Luck on your interview, Mr & Mrs Nakrani! My students enjoy the short and sweet stories from Sam Margolis' Simple English News, but they particularly enjoy Simple English News: UNUSUAL NEWS stories. Here are some funny stories keyed to the N-400 sections. 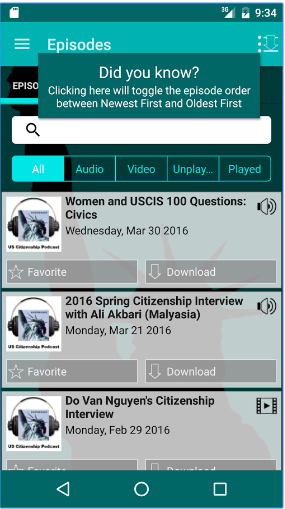 Click the evoca widget to listen to an audio clip of the story. Here is a word search puzzle based on the new USCIS 100:58-87. The vocabulary word are presented in chronological order. Find only the bold words. Numbers are not included. Good luck! Here are ten sentences for reading and dictation. These sentences are based on answers to the USCIS 96:41-50 Questions. Instead of phrasal responses, the answers are given in complete sentences. 41. Patrick Henry said, “Give me liberty or give me death”. 42. Germany, Italy, and Japan were some countries that were our enemies during World War II. 43. Alaska was the 49th state added to our Union. 44. A President can serve 2 full terms. 45. Martin Luther King, Jr. was a civil rights leader. 46. A candidate for President must be a native-born, not naturalized, citizen; at least 35 years old; and have lived in the U.S. for at least 14 years. 47. There are 100 Senators in the U.S. Senate because each state elects 2 Senators. 48. The President nominates judges for the Supreme Court. 49. There are 9 Supreme Court Justices. 50. The Pilgrims came to America to gain religious freedom. Here are ten sentences for reading and dictation. These sentences are based on answers to the USCIS 96:01-10 Questions. Instead of phrasal responses, the answers are given in complete sentences. 31. The President is elected for a 4-year term. 32. The Supreme Court is the highest part of the Judiciary Branch. 33. The duties of the Supreme Court are to interpret and explain the laws. 34. The Constitution is the supreme law of the United States. 35. The Bill of Rights is the first 10 amendments to the Constitution. 36. The capital of the state of California is Sacramento. 37. Arnold Schwarzenegger is the current Governor of California. 38. The Speaker of the House becomes President if both the President and Vice-President die. 39. John G. Roberts, Jr. is the Chief Justice of the Supreme Court. 40. The original 13 states were Virginia, Massachusetts, Maryland, Rhode Island, Connecticut, New Hampshire, North Carolina, South Carolina, New York, New Jersey, Pennsylvania, Delaware, and Georgia. 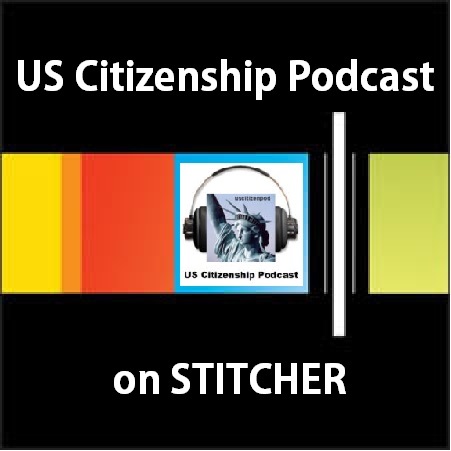 New USCIS Resources Are Coming!!! 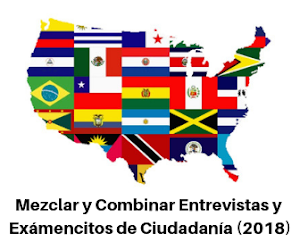 *Spanish and Chinese translations of the 100 questions will by available online at http://www.uscis.gov/ by July 15, 2008. 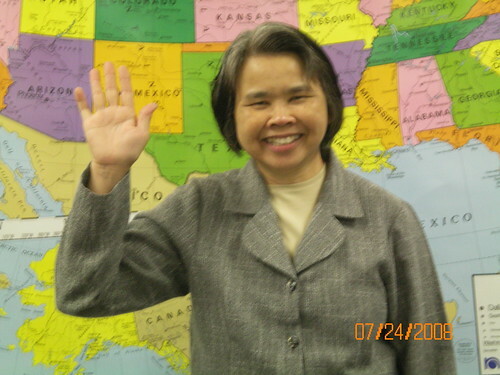 *Vietnamese and Tagalog translations of the 100 questions will be available online by September 1, 2008. *Revised Civics Flash Cards and a new product - English Vocabulary FlashCards - will be available free online, and for purchase from the Government Printing Office, in late summer. Both sets will becolor-coded red, to distinguish them from the blue flash cards for thecurrent test. *Updated "Quick Civics Lessons" (also color-coded red) will be online by September 1, 2008. As has been the established practice, we expect free dissemination to all naturalizations applicants reporting to the Application Support Center for their fingerprinting appointments to begin on October 1, 2008. * For direct access to these and other information on the Redesigned Naturalization Test new test materials please save this link www.uscis.gov/newtest. This link is already functional (please do try it!). However, please remember that the new materials listed above willonly be available on or after the dates mentioned. If for some reason the link fails to work for you, simply type it in the address box after you get to our home page. My friend and I went to San Francisco today, to see the Frida Kahlo exhibit at SFMOMA and the new Contemporary Jewish Museum. Both were interesting, but the highlight of the day was visiting the San Francisco Museum of Craft and Folk Art, which has relocated from its former location at Fort Mason to it's new location in the SF Yerba Buena Museum District. 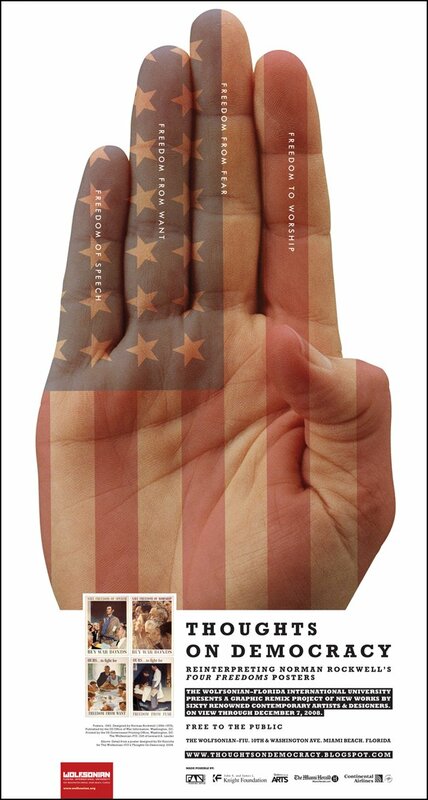 SFMOCFA's current show is American Symbols: From Lady Liberty to the Stars and Stripes. This exhibit features American folk art and crafts with Lady Liberty, Uncle Sam, or the American Eagle designs, but the Flag dominated the exhibit. I learned that the exact pattern of the stars was not specified prior to 1912, so there are several flags in the exhibit that do not follow the "standard design". I quilt and crochet, so I studied the modern quilt, crazy quilt, filet-crochet, and penny-stitch flags very closely. I also collect stamps, so I was overjoyed to see a flag (see above) made from red stamps, postmarks (cut from white envelopes), and blue stamps. Many of the postmarks encouraged people to WWII War Bonds. My friend was particularly moved by the Lakota Gauntlet Gloves and the Cheyenne Flag Moccasins, incorporating the US Flag in Native American Pow-Wow regalia. And everyone stopped to admire the gorgeous 1912 Japanese-American Friendship Kimono (delivered to President Taft along with the Cherry Trees that line the Potomac). Many of the items in the show were collected by artist/educator (and Eagle Scout) Kit Hinrichs. For more about Kit Hinrich's Americana collection, see: STUDIO MADE FOR THE STARS AND STRIPES. Also checkout Kit Hinrichs' books: 100 American Flags: A Unique Collection of Old Glory Memorabilia (2008) and Long May She Wave: A Graphic History of the American Flag (2001). Kit Hinrichs is also participating in a new exhibit, Thoughts on Democracy, now on display at the Wolfsonian Museum, FL. Whether you are in California, Florida, cyberspace, or your local bookstore, please see Kit Hinricks art and collections--you will learn a lot about Americana. When you are in San Francisco, visit San Francisco Museum of Craft and Folk Art--you will see great art! Click here to see a great video of people auditioning to sing the National Anthem for a local minor league baseball team. Click once for a HUGE picture of fireworks. Checkout Yahoo News Independence Day slide show for many more pictures. Search for and sing along with patriotic music videos on YouTube. I particularly enjoyed this video of America the Beautiful sung with gusto by the Gaither Vocal Band. July 4 Handout. On June 11, 1776, Congress appointed a "Committee of Five": John Adams (Massachusetts), Benjamin Franklin (Pennsylvania), Thomas Jefferson (Virginia), Robert Livingston (New York), & Roger Sherman (Connecticut), to write a paper declaring America’s independence from England. On July 2, 1776, the Committee of Five presented their draft and the Continental Congress voted for independence from England. In a letter written to his wife Abigail, John Adams predicted that July 2nd would become a great American holiday. Between July 2-4, Congress made a few changes in the text, and deleted a passage about the slave trade. On July 4, 1776, the Declaration of Independence was approved and published. The first public reading was on July 8th in Philadelphia, and General George Washington had the Declaration of Independence read to his troops on July 9th. It is traditional to read the Declaration of Independence publicly on July 4th as a part of Independence Day celebrations. 96:09 What do we celebrate on the 4th of July? 96:10 Independence Day celebrates independence from whom? 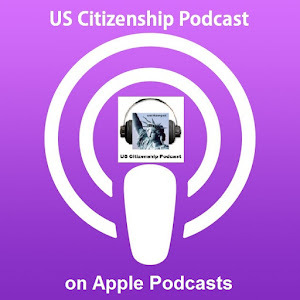 96:11 What country did we fight during the Revolutionary War? 96:54 Who was the main writer of the Declaration of Independence? 96:55 When was the Declaration of Independence adopted? 96:56 What are some of the basic beliefs of the Declaration of Independence? 100:08 What did the Declaration of Independence do? 100:09 What are two rights in the Declaration of Independence? 100:62 Who wrote the Declaration of Independence? 100:63 When was the Declaration of Independence adopted? 100:99 When do we celebrate Independence Day? 100:100 Name two national U.S. holidays. 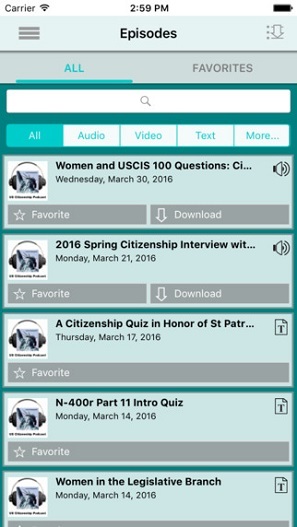 My students love listening to Sam Margolis' Simple English News, a website that publishes very short news stories about current events. The news stories also include short audio clips that are less minute. 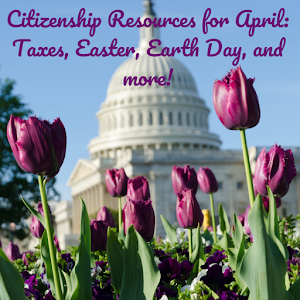 Here is a selection of Simple English News stories keyed to the new USCIS 100:100: Name two national U.S. holidays.